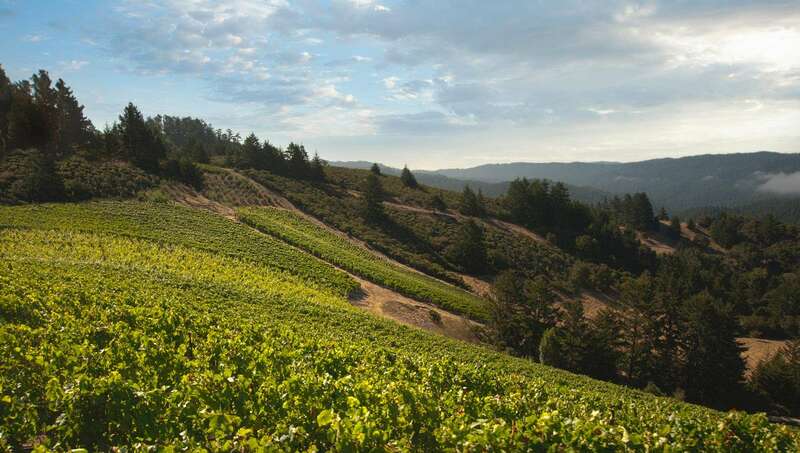 Santa Cruz Mountain-based winery of Rhys Vineyards has certainly created an epicenter of change on its own in the few short years of its existence, firmly showing that the abomination of the “modern school” of California wine is a crisis of conscience, not of climate change. …Kevin Harvey of Rhys Vineyards opined that 2011 “could very easily be our finest vintage to date.” I guess beauty is in the eye of the beholder. Needless to say, I have been looking forward to sinking my teeth into the 2011 vintage from California for a year and a half now and was really delighted with what I tasted from most estates, as it looks likely to be one of the most cellar-worthy vintages in many, many years- at least for traditionalists. The 2011 Horseshoe Vineyard Chardonnay from Rhys Vineyards weighs in at a cool and classy thirteen percent alcohol and is a gorgeous example of this fine vintage. The bouquet is deep, complex and nicely reserved, offering up a fine blend of pear, fresh pineapple, a gentle leesiness, orange zest, a beautiful base of soil, a hint of marzipan and a very discreet base of vanillin oak. On the palate the wine is deep, pure and racy, with a lovely core of fruit, superb focus and nascent complexity, bright acids and excellent length and grip on the very classy finish. If one can imagine a blend of a great example of Chassagne “la Romanée” and the great chardonnays made at Mount Eden Vineyards in the late 1970s and early 1980s, one can get a feel for the style of this absolutely superb young chardonnay. This wine is eminently drinkable today, but it clearly will gain in complexity with three or four more years of bottle age and should have no troubles cruising at least a dozen years in bottle. Impressive juice! 2013-2025+? 94. The 2011 Alpine Vineyard chardonnay from Rhys Vineyards is another absolutely stellar bottle in the making, offering up a deep, pure and magically complex bouquet of delicious apple, buttered pears, orange peel, a nice touch of leesiness, a very complex base of stony soil tones, a bit of hazelnut, very suave framing of new oak and a touch of smokiness in the upper register. On the palate the wine is pure, full-bodied and tightly-knit, with great nascent complexity, a superb core, bright, zesty acids and outstanding length and grip on the very classy finish. This almost has a bit of Meursault- like personality to it, and like the 2011 Horseshoe Vineyard, this wine will age impeccably well on its seamless balance and will be even better with a few years’ worth of cellaring to unlock its secondary layers of complexity. A great wine. 2013-2025+. 94. Rhys Vineyards’ second label, Alesia, is home to a very fine pinot noir made from purchased grapes from the Alder Springs Vineyard in the 2011 vintage. I love the octane level on this wine- 12.5 percent- which gives the wine impressive vibrancy and bounce on the palate. The bouquet is a complex and very appealing blend of red and black cherries, beetroot, Mendocino herb tones, a nice touch of cola and a fine base of dark soil tones. On the palate the wine is fullish, suave and balanced, with a fine core, nice complexity, very moderate tannins and a long, tangy finish. The wine closes with a nice touch of herbacité that should morph into lovely savory tones with a few years bottle age. 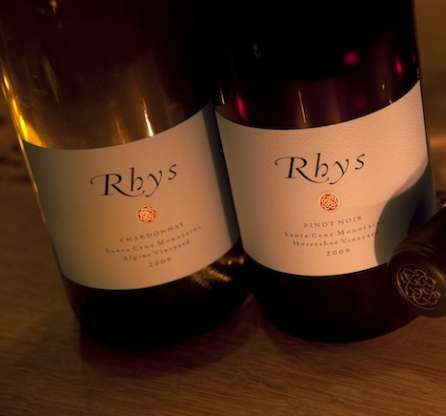 It is not quite as soil-driven as the estate bottled pinots from Rhys, but it shares the same suave personality traits that underscore how well the team at Rhys really understands this varietal. This wine is quite drinkable out of the blocks, but I would give it a handful of years in the cellar to allow its tannins to fall away a bit more and its secondary layers of complexity to emerge. Good juice. 2015-2032+. 89+. As the Bearwallow bottling is made from purchased grapes in Mendocino, it is usually a touch riper than the wines from the estate’s own vineyards in the Santa Cruz Mountains, and this is certainly the case with the 2011, which comes in at a fairly ripe 13.5 percent alcohol in this low octane vintage. Of course, 13.5 percent is still quite low by contemporary standards and the wine is absolutely stellar, soaring from the glass in a beautifully pure and ripe nose of black cherries, a touch of plum, gentle herb tones, espresso, dark soil nuances and a discreet base of vanillin oak. On the palate the wine is deep, full-bodied and tangy, with very good depth at the core, moderate tannins and lovely length and grip on the youthful finish. A very well-balanced and classy wine, the 2011 Bearwallow will age long and gracefully. This is a really superb bottle of pinot noir, but it does not possess quite the same brilliant inner core of the very best 2011 Rhys pinots. 2016-2035+. 91+. I am not sure if the new plantations at the Home Vineyard (planted in 2007) have made it into this lovely 2011 pinot noir, or if there remains a solitary single barrel of this wine produced, but I am hoping that there is more, as this wine is outstanding. The stunning nose wafts from the glass in a mix of red and black cherries, a touch of beetroot, mustard seed, fresh thyme, a beautiful base of soil and a nice touch of smoky new oak. On the palate the wine is deep, full-bodied, pure and beautifully complex out of the blocks, with a superb core of fruit, fine-grained tannins and absolutely stellar length and grip on the focused and very classy finish. Great juice! 2018-2040. 93. The 2011 Family Farm bottling has come in a tad less ripe than the Home Vineyard (12.8 percent alcohol versus 13-2 percent- both very, very civilized octane numbers in my book!) and as a result the wine is even a touch more red fruity and soil- driven in this vintage. The gorgeously complex nose offers up scents of cherries, beetroot, pomegranate, a great, complex base of soil, vinesmoke, a touch of nutskin, fresh herbs and a lovely, discreet framing of new oak. On the palate the wine is deep, full- bodied, complex and very transparent, with a fine core of fruit, suave tannins, tangy acids and excellent focus and grip on the very long and dancing finish. High class pinot. 2017- 2040. 93+. The Skyline Vineyard pinot noir from Kevin Harvey and his team at Rhys is just stellar in 2011, with its low octane personality (12.6 percent ABV!) delivering great minerality and nascent complexity on both the nose and palate. The wonderfully complex nose offers up a “cool fruit” profile of cherries, beetroot, stony minerality, a touch of menthol, thyme, a bit of mustard seed, vinesmoke and a gentle base of new wood. On the palate the wine is pure, fullish and very intensely flavored, with a fine core of fruit, suave, seamless tannins, tangy acids and a very, very long and transparent finish. This is great wine in the making and a very grown up bottle of California pinot noir! 2018-2040. 94+. These Santa Cruz Mountain vineyards have produced a beautiful triad of low octane and extremely promising pinot noirs in this lovely vintage. The 2011 Horseshoe tips the scales at 12.4 percent alcohol (how nicely these wines are going to fit into blind tastings of equally low octane 2011 red Burgundies a decade down the road!) and offers up a superbly complex and pure bouquet of red berries, beetroot, wild strawberries, vinesmoke, fresh herbs, a touch of lavender, stony minerality, mustard seed and just a hint of oak. On the palate the wine is deep, fullish, pure and very, very soil-driven, with a sappy core of fruit, great lightness of step, modest tannins and simply great length and grip on the focused and tangy finish. Great, great juice! 2018-2040. 94+. The 2011 Alpine Vineyard pinot noir from Rhys Vineyards is another low alcohol beauty, coming in at 12.3 percent and offering up a stunning bouquet of dark berries, black cherries, dried eucalyptus, tea-smoked duck, gorgeous minerality, vinesmoke, fresh herbs and a dollop of new wood. On the palate the wine is pure, fullish and very intensely flavored, with a fine core, stunning transparency, great, nascent complexity, moderate tannins and magical length and grip on the focused and utterly classic young finish. Another absolutely great wine and probably the pick of the litter in this stunning lineup of 2011 Rhys pinot noirs. 2018-2040. 95+. These are still quite young vines, having only been planted in 2004, but it is quite clear that the Rhys team is keeping a tight rein on yields here and the 2010 Horseshoe syrah is outstanding. It is not quite as soil-driven as the 2010 Skyline syrah (this vineyard does not share the same limestone found at Skyline), but it is every bit as complex and impressive. I love its octane level of 12.8 percent. The superb nose offers up scents of cassis, grilled venison, black olive, pepper, a nice touch of syrah’s medicinal overtones, a bit of vinesmoke and just a hint of oak. On the palate the wine is full-bodied, pure and nicely transparent, with a fine core, moderate tannins and excellent complexity on the long and impressive finish. Aromatically, this is more along the lines of Cornas (to Skyline’s Côte-Rôtie tilt), but it is lighter on its feet that most Cornas and relies more on intensity of flavor, rather than muscle. It is an excellent wine that is already approachable, but which will really be better with a handful of years in the cellar. Fine juice. 2013-2035. 92. The 2010 Skyline Vineyard Syrah from Rhys Vineyards is a stunning young bottle of wine, with great breed and complexity on both the nose and palate and exceptional potential for cellaring. The cool and classic nose wafts from the glass in a blend of cassis, black pepper, a touch of meatiness, incipient notes of black olive, a beautifully pure and complex base of stony soil, a touch of dried violets and discreet base of vanillin oak. On the palate the wine is deep, full-bodied and nascently complex, with a lovely core, a very soil-driven personality, ripe, well-measured tannins and excellent length and grip on the focused and very classy finish. Low octane syrah in California can be pure magic (this weighs in at a very adult 12.8 percent alcohol) and the 2010 Skyline from Rhys Vineyards is a perfect example of just how great this varietal can be here if it is treated properly and picked in a timely manner. Great juice! 2015-2035. 93+.